Belgium has a decent public transport system with buses, trams, trains and boats used. But this paragraph only discusses TRAIN travel. Rail transport is used for regional, national or internatonal transport needs. There are NO long distance bus services except the Eurolines and similar 'low cost' busses to other European countries. 1. P-train : the 'peak hour' train. They can be usually slow and quite crowded. As the name indicates usually only in the real peak hours. 2. L-trains : the slow trains, stopping at every station. Some of these are only a mile or 2 apart, so the overall journey can be slow. The rolling stock is usually decent and is largely replaced in 2014. 3. IC-trains: also usually running hourly, intercity trains are usually (but not always) operated using the most modern trains, and stop only at the largest stations. Intercity routes are identified by an upper-case letter, which means there's a possibility of confusion between the Belgian Intercity route E ("ICE") and the German InterCity Express trains ("ICE") which serve Belgium! Most tourists visiting Belgium are likely to use IC trains more than any of the others. With the new railplan of december 2014 former regional IR trains are also called IC trains, but stop in more stations (of regional importance) than other IC trains. This makes that on some lines (like Brussels-Ghent) there is a large travel time difference between different IC trains, so check the travel time or number of intermediate stops before taking a train. 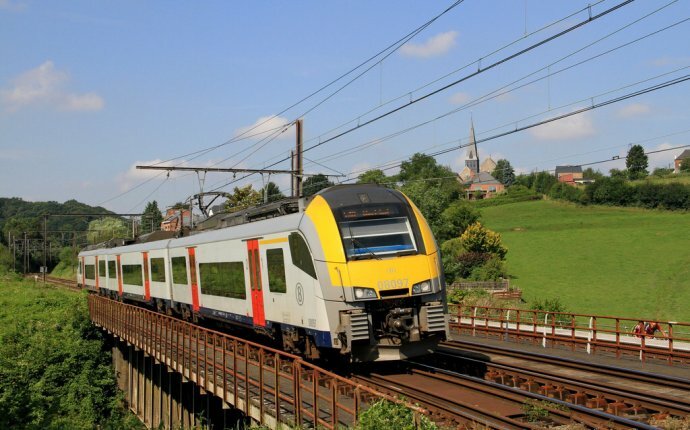 4. International trains, which nowadays are restricted to the "Benelux Intercity" trains between Brussels, Antwerp, Rotterdam and Amsterdam, and the occasional EuroCity train between Brussels, Luxembourg and Strasbourg/Switzerland. There are also Belgian IC trains that continue abroad to some major stations, like from Liège to Maastricht; from Brussels or Ghent to Lille; from Brussels and Arlon to Luxembourg. 5. Thalys: A joint Franco-Belgian company running French TGV trains on the Paris - Brussels route, with some journeys extended to Amsterdam or Cologne. Special fares apply on Thalys, seat reservations are compulsory and Belgian domestic tickets are not vaild. 6. German ICE trains run on the Brussels - Liege - Aachen - Cologne - Frankfurt route a few times each day. As with Thalys, special fares apply and Belgian domestic tickets are not valid. 7. Eurostar trains serve the Brussels - Lille - London route. By far the most convenient way of getting between central London and central Brussels. You will find many discounts for excursions and tours st petersburg russia on tripadvisor.com.